Beets are not as common or popular as some other vegetables, such as broccoli and carrots, but they are sweet and nutritious and make a wonderful addition to meals. The tops of beets are a good source of vitamin A, while the red roots are a good source of vitamin C. They are also high in fiber, B vitamins and calcium. In the United States, beet roots are usually eaten cooked whole and then sliced up as a side dish or as an addition to salads. Remove the green tops from the beet roots when harvesting. Leave about 1 inch of stem to help preserve the flavor and color of the root. Wash the beets thoroughly before cutting, but be careful not to break the skin. Breaking the skin allows some of the nutritional value to escape. Cook the beets, if desired, and then quickly cool them in ice water. This makes it easier to remove the skin and cut the beets into small pieces. Rub the beet skin away with a paper towel or soft sponge, and then trim off any undesirable sections of the root with a knife. Cut the beet into large or small slices or cubes, depending on your preference. Grated raw beets work well as a garnish on salads. Do not cut beets on a cutting board or counter top. 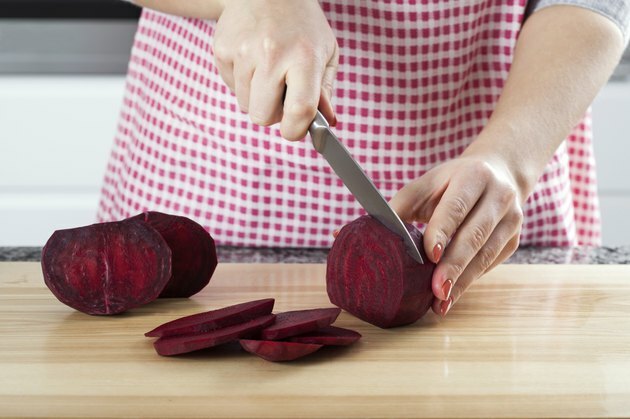 Slice beets on a glass plate or work surface, and clean up any spilled juice immediately.